Discovered at a Virginia Beach contest by Neil Blender and Lance, a young Mike Vallely was asked to join the Powell-Peralta team and quickly rose to fame as a premier street skater. After initially rejecting the Roach graphic, Vallely worked closely with VCJ on an elephant theme. Mike and his elephant deck were both very popular. Mike currently runs Street Plant, a 100% independently owned and operated family business. "100% Independent Skateboarding for Love, for Fun. No rules, no divisions, no schools. Just a Skateboard as a Paintbrush and the World as an Empty Canvas. Skate. Create. Enjoy!" 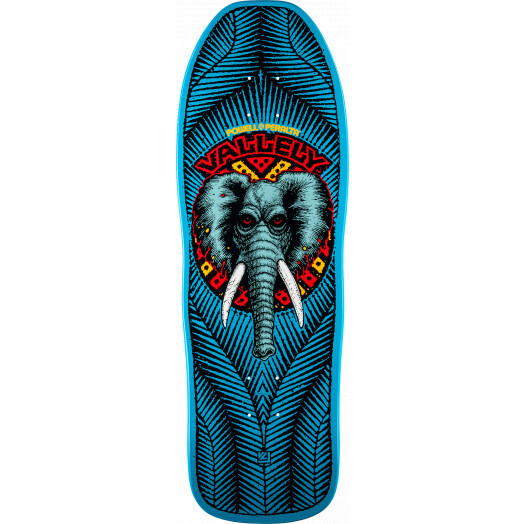 Ive had this deck in the past and recently bought it again and its one of the most functional yet aesthetically pleasing boards i own, the shape is versatile enough to ride essentially anything on and the concave is absolutely perfect. This is one of the best boards Powell Peralta has ever produced.